With over 100 species of ants in Canada, ants are a common pest in your home and garden. The majority of ants are a simple nuisance, but once an ant problem has reached infestation level, it becomes much harder to eliminate from your home. You will see them. Ants live in large colonies usually located in underground tunnels. Most species will nest outside buildings, and enter just to find food. A successful scout leaves a scented trail for other ants to follow back to the food source. This accounts for the orderly trail you sometimes see when ants are in transit! Store sugary foods in glass jars with rubber gaskets or in plastic containers with snap-lids. Keep kitchen counter tops clean and sweep or vacuum the floor frequently, especially around pet dishes. Rinse containers before disposing of them in garbage or recycling bins, and empty kitchen garbage containers frequently. Compost containers should not be located too close to the house. Repair cracks around mouldings and plumbing, in the foundation or along interior and exterior walls. Ants will not cross sticky barriers -Use two-sided tape around plants stands and fruit trees. 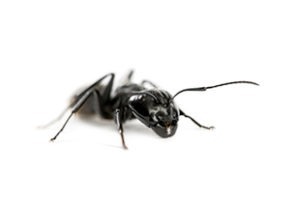 Depending on the severity of your ant problem, you may be able to treat a minor ant problem without the assistance of professionals. If you think you may have an infestation to contend with, we recommend contacting us to discuss your particular circumstances. As always, estimates and advice are free, and we will give you our professional opinion and advice for treatment. Ant Baits. 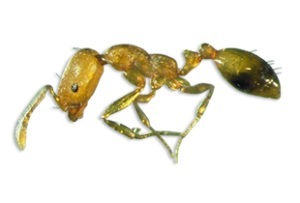 Ant baits containing boric acid or hydramethylnon will slowly eliminate the colony, and are generally of low toxicity to other animals. These products are commonly sold at hardware stores. Ant trails are frequently found along baseboards, carpets and wall edges, or along the edges and corners inside cabinets. Place bait in the path of foraging ants, but out of the reach of children and pets. Chemical Sprays and Dusts. Chemical barrier treatments can be applied to door and window frames to prevent outdoor nesting species from entering indoors. Spraying indoors where trails have been observed may cut off food and water sources for an indoor nest. Unfortunately, some chemical-barrier spraying may cause the colony to bud. This is one reason the DIY approach can be unpredictable. The pavement ant gets its common name from the fact that colonies usually make their homes in pavement. It is distinguished by one pair of spines on the back, two nodes on the petiole and grooves on the head and thorax. During early spring, colonies attempt to conquer new areas and often attack nearby enemy colonies. These result in huge sidewalk battles, sometimes leaving thousands of ants dead. Because of their aggressive nature, they often invade and colonize seemingly impenetrable areas outside their native range. In summer, the ants dig out the sand in between the pavements to vent the nests. 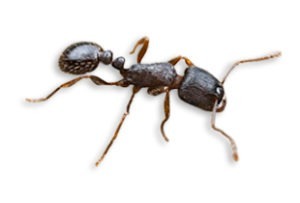 Carpenter ants are also known as sugar ants. They are large (0.3 to 1 inch in size). They build nests inside wood consisting of galleries chewed out with their mandibles, preferably in dead, damp wood. They do not consume the wood, unlike termites. Sometimes, carpenter ants hollow out sections of trees. They also commonly infest wooden buildings and structures and are a widespread nuisance and major cause of structural damage. Pharaoh ants are smaller than their pavement ant and carpenter ant cousins, with a colouring that ranges from yellow to light brown to red. Their nests are usually found near warm moist areas and in hard to reach areas. Under floors, in furniture, behind baseboards, and in between linens are some examples of where these pests like to hide out. Because their nests are typically very large and spread out, pharaoh ants are difficult to get rid of. If disturbed, the colony may fragment or “bud” to form several new nests. When treating a colony you must make sure your treatment is thorough so that the colony doesn’t bud.